Obcy Aktorzy / Foreign Actors takes as its starting point Polish cinema. Polish actors were invited to audition in Warsaw with dialogue from a favourite Polish film. The actors in Obcy Aktorzy / Foreign Actors perform a series of moments from the films Ashes and Diamonds (1958), Man of Iron (1981) Dekalog 4 (1988) and Sequence of Feelings (1993). Famous Polish actress Ewa Kasprzyk was invited to join the cast and re-perform her dialogue from Sequence of Feelings . During a process of revision and rehearsals, the words and characters from the original films became recontextualised into a new narrative, including actors and characters inhabiting multiple fictions and dramatic spaces. Aesthetic, sexual, historical and dramatic senses are manipulated to create a video that is a dialogue between artist and actors, between language and image, between past and present. Born 1978, Matthew Noel-Tod studied Fine Art at The Slade School of Fine Art, London, Fachhochschule Aachen, Germany and Norwich School of Art and Design, UK. Solo exhibitions and screenings include, Outpost Gallery, Norwich, UK (2006), Kino.Lab, Centrum Sztuki Wspolczesnej Zamek Ujazdowski / CCA, Warsaw, Poland (2005 / 2006), San Francisco Art Institute, San Francisco, USA (2005), Cooper Gallery, University of Dundee, Dundee UK (2004), LUX Salon, LUX, London UK (2004) and Unit B Gallery, Chicago USA (2003). His video Nausea (2005) received its world premiere in The Times bfi 49th London Film Festival, National Film Theatre, London UK (2005) and was selected for the 35th International Film Festival Rotterdam, Netherlands (2006). In 2005 he was artist in resident at Centre for Contemporary Art, Zamek Ujazdowski, Warsaw. 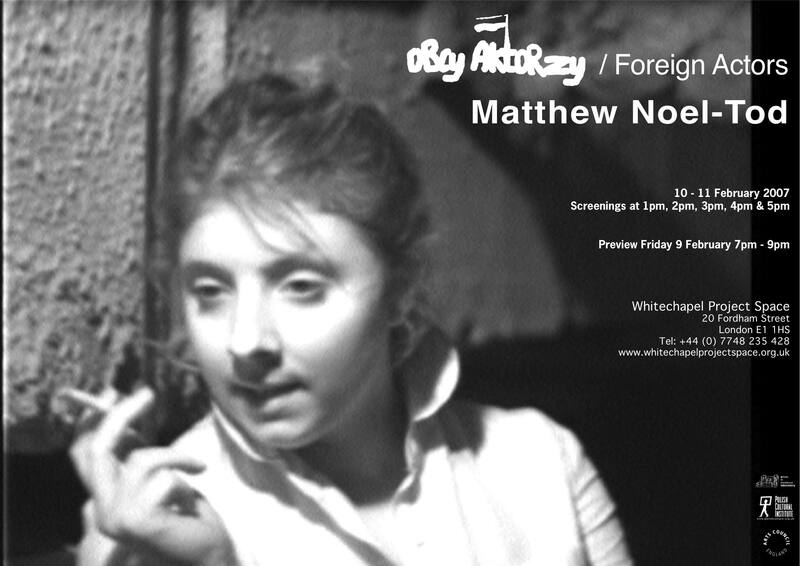 His video, Obcy Aktorzy / Foreign Actors (2006) was launched in Warsaw in June 2006. His video Jetzt Im Kino (2003) is in the collection of Centre Georges Pompidou, Paris, France.